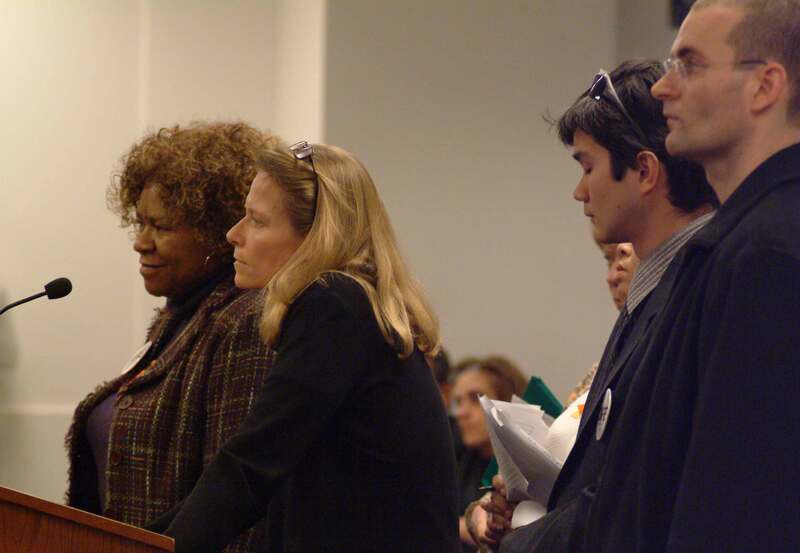 Substance Managing Editor Sharon Schmidt presented the Chicago Board of Education with three requests at the Board's February 24, 2010 meeting. Left to right (above): Lois Ashford, Sharon Schmidt, Xian Barrett, Wade Tillett, all CPS classroom teachers concerned about the over-use and abuse of standardized testing. Substance photo by Garth Liebhaber. Reporter's note: The first "official" words on Chicago parents' rights to opt out our children from standardized testing were written by CPS officials after I delivered the following speech the the Chicago Board of Education February 24, 2010 meeting. "Parents are not required to sign releases for their children to participate in any assessment series. If parents choose to exclude their children, the school has no obligation to provide an alternate activity. Your child will be asked to engage in a silent, self-guided activity." Since that time, school administrators have understood that children do not have to take tests or be excluded from school when opting out. The following was my presentation at the February 2010 Chicago Board of Education meeting. Good morning. My name is Sharon Schmidt. I am the managing editor of Substance. I am a parent of a CPS graduate and two younger children. I am also a teacher in the CPS. I am here to talk about testing in the elementary schools. I have three points to make. Number One: Every parent needs a schedule of every test every child is expected to take. As you know, the schedule for testing varies in the different schools and classrooms. For example, primary grade students in some schools take the DIBELS battery of tests three times a year while others have progress monitoring every other week. Students in 3rd through 8th grade in some schools have two days or three days of Learning First benchmark tests three times a year, as well as the computerized Scantron tests. Of course, all this is on top of the ISAT. Parents need to know what the tests are and when they are being administered. They need information at the beginning of the year and throughout the year. Number Two: Immediately following the test, parents need a copy of the test and an explanation of how it was scored and how the results are being used. Number Three: You need to make a provision for parents to opt out their children from any inappropriate, experimental, or excessive testing. We are talking about young children who are being pressured repeatedly. We would like to hear from you very soon about these issues. Thank you. After I spoke, the vice-president of the Chicago Board of Education, Clare Munana, the CEO of the public schools Ron Humberman, and the Chief Education Officer Barbara Eason Watkins engaged in conversation with me. Munana said I was right, that parents need information and they will do better giving it. Eason Watkins said a lot of the testing choices are made by the local schools and that results are being given of Learning First tests with report cards so that parents can see how their children are doing. Huberman said the Scantron tests and others are online and will give teachers immediate feedback. When he mentioned that I told him that I was confused about the Scantron test and wondered how often it was being administrated. He said that that was still being worked out. I reiterated that parents need the choice to opt out of excessive testing. After my presentation they had me meet with a woman from Eason Watkin's office, named Angie Alleman. She is a person I will try to work with to obtain information that I can share in Substance. This is wonderful plan of action for parent involvement — and school responsibility — and should be spread far and wide. Everybody put this on Twitter and post to activist groups. I applaud you for all your hard work. I thank you for speaking on our behalf. read this contract and weep. We certainly appreciated his principal's willingness to accomodate our decision.